How do great innovators like Steve Jobs, Jeff Bezos, or Richard Branson come up with their big, breakthrough ideas? How do they manage to spot the opportunities for industry revolution that everyone else seems to miss? What is it that enables them to imagine radically new or different ways of doing things that will fundamentally change customer expectations and behaviors, or break long-established industry paradigms, or shift the entire basis for competitive advantage? Where do they get the brilliant flashes of inspiration that lead them to their game-changing discoveries? This is the essential question at the heart of my new book “The Four Lenses of Innovation: A Power Tool For Creative Thinking.” And the answer might surprise you. The conventional view has long been that these remarkable people are simply creative geniuses and business visionaries – they are just “wired” differently from the rest of us. For them, innovation and wealth creation seem to come naturally, almost “reflexively.” It’s as if they were somehow born with magical skills that allow them to think and act in ways that mere mortals, or ordinary companies, cannot possibly hope to match. But what if that’s not true? What if we’re all capable of seeing the world like top innovators do? What if every single one of us has the innate mental capacity for idea generation and imaginative problem-solving, and all we have to do is learn how to unlock our own inner genius? Let’s be clear about one thing: some individuals, either thanks to nature or nurture (or the fortunate interaction of both), have been able to develop their creative and entrepreneurial skills to a much higher degree than others. But that doesn’t mean that these skills are forbidden to the rest of us. Just as you can learn to cook or to play the piano, you can learn to enhance your ability to come up with innovative ideas. In my new book, I examine lots of inspiring examples of business innovation in an attempt to open up that mysterious “black box” we call the human mind and take a good look at how the creative process works. Because if we can truly understand the perspectives or thinking patterns that are common to all of these cases, then perhaps there’s a chance we can reverse-engineer the mind of the innovator. Maybe we can take these thinking processes and turn them into a systematic methodology for generating radically innovative ideas and opportunities. Challenging Orthodoxies Innovators question and overturn deeply entrenched beliefs and common assumptions, exploring new and highly unconventional answers. They never accept that there is only one “right” way of doing things inside a company or across an industry. Outstanding examples would be Steve Jobs, Nicolas Hayek, Elon Musk, Michael Dell, Herb Kelleher, Ingvar Kamprad, Charles Schwab, Reed Hastings, James Dyson, and Jeff Rubin. Harnessing Trends Innovators understand change. The pay close attention to nascent trends and discontinuities that have the potential to profoundly impact the future of an industry, or that could be harnessed to substantially alter the rules of the game. Examples include Bill Gates, John Mackey, Jeff Bezos, Steve Jobs, Howard Schultz, Reed Hastings, and Phil Knight. Leveraging Resources Innovators look at a company not as a set of business units but as a collection of core competencies and strategic assets that can potentially be repurposed, redeployed, and recombined to create new growth opportunities. Consider Walt Disney, Richard Branson, Larry Page and Sergey Brin, Steve Jobs, Jeff Bezos, Carlos Moro, Duncan McFie, Percy Spencer, Joe McVicker, and Arthur Fry. Understanding Needs Innovators learn to live inside the customer’s skin. They put themselves in the customer’s shoes and are able to feel their “pain points”, identifying unmet or unvoiced needs others have overlooked or ignored. Then they design solutions from the customer backward. Think about individuals like Gary and Diane Heavin, Mark Zuckerberg, A.G. Lafley, Fred Smith, Malcolm McLean, Steve Jobs, Reed Hastings, Travis Kalanick, Tony Fadell and Matt Rogers. What this reveals is that innovators don’t just come to their ideas by staring out of the window waiting for a Eureka moment. Whether they are conscious of it or not, they discover big, game-changing opportunities by looking at the world through a different set of perceptual “lenses”. And the great news is that we can do the same! We can learn to use these same four lenses to consider common situations or problems from the innovator’s perspectives, and thereby dramatically improve our ability to look through the familiar and spot the unseen. If you’re hunting for your next big idea, try deliberately using these four proven ways to generate the kinds of insights that will inspire exciting new products, services, strategies and business models. 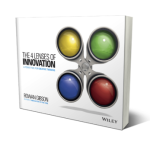 You will be amazed at how the lenses will unlock your innovation power.